The Canon IRC-3380Ne colour copier allows large format printing, while combining the efficiency of a powerful office copier with the versatility of a high quality printer, fax machine, and scanner. It is an easy to use device that offers eco-friendly features on top of its attractive budget-friendly qualities. The Canon IRC-3380Ne colour laser printer is the ideal choice for busy workgroups, as it offers integrated networking for easy sharing. However, the IRC3380Ne Canon photocopier only offers average print rates, compared to competing multifunction units that offer very impressive print speeds. 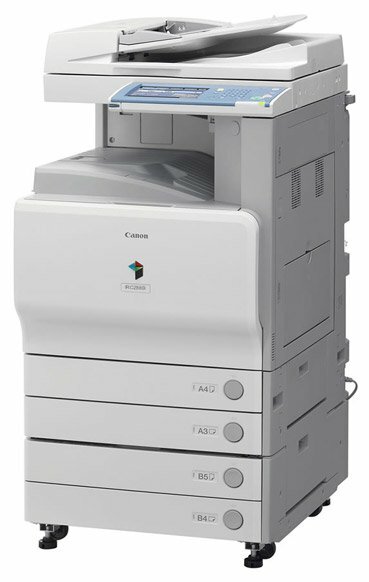 The Canon IRC-3380Ne office colour printer measures about 565x755x791 mm. It includes an automatic document feeder, which also offers duplex scanning for double-sided documents, along with an automatic duplex unit for printing on both sides of the paper. It has a colour printing engine that produces consistent print quality, along with a reliable copier that offers the same output rate as the printer. The Canon IRC-3380Ne laser printer can handle multiple media types, including paper sizes as large as A3. Colour toner cartridges for the Canon IR-C3380Ne multifunction printer will last up to 14,000 pages before expiring. Large format printing is a definite advantage for the Canon IRC3380Ne colour laser MFP, not to mention its network capability. The Canon IRC-3380Ne colour printer allows high-quality colour printing, while offering advanced copy, fax, and scan features. Additional upgrades provide even more versatility and productivity for users, like the optional finishers and the large hard disk drive. This eco-friendly machine reduces print costs by using high-capacity cartridges and duplex printing, which help cut down paper waste. The Canon IRC-3380Ne copier, however, fails to impress in terms of print speed. The IR-C3380Ne printer averages 33 ppm for black and white prints and 30 ppm for colour prints, which is far less impressive than competing devices with 40 to 50 ppm average rates.